TS EAMCET 2019 Hall Tickets/ Telangana EAMCET hall tickets @ www.eamcet.tsche.ac.in, TS Engineering, Agriculture and Medical Common Entrance Test (EAMCET) is conducted by Jawaharlal Nehru Technological University Hyderabad on behalf of TSCHE. This examination is the prerequisite for admission into various professional courses offered in University/ Private Colleges in the state of Telangana. JNTU, Hyderabad issued the TS EAMCET 2019 Notification and the University invited the Online Applications from the Eligible students who wish to appearing for EAMCET 2019 as per its schedule. TS EAMCET 2019 Hall Tickets will release on April 20, 2019. The admit cards for the exam will be released on the official website of Telangana State Engineering, Agriculture & Medical. The Registered candidates can download their hall tickets from the official website of TS EAMCET, eamcet.tsche.ac.in. Exam timings: 10-00 A.M. to 1-00 P.M. and 3-00 P.M. to 6-00 P.M. Registered students are advised to check the official website regularly for further updates. Examination centre, examination time and important instructions will be mentioned on the hall tickets. In case any correction is needed then the candidates must contact the admission officials. Candidates are advised to preserve the admit card till the conclusion of the admission process. TS EAMCET 2019 Examination is being conducted by the Jawaharlal Nehru Technological University Hyderabad on behalf of TSCHE. The entrance examination is mandatory for admission into various professional courses which are offered in University or Private Colleges in the state. Candidates may check the official website for further information. The Candidates who were applied for this stream, they are waiting for their admit cards/ hall tickets. The JNTU Officials have uploaded the hall tickets of eamcet aspirants. So, candidates can download their hall tickets from the official website only. This is the entry pass of examination hall. Candidates should keep their hall tickets while going to the examination hall and should preserve the hall tickets up to counselling and also it is useful to the future reference. TS EAMCET: Engineering, Agriculture & Medical Common Entrance Test (TS EAMCET) is conducted by Jawaharlal Nehru Technological University Hyderabad on behalf of TSCHE. This examination is the prerequisite for admission into various professional courses offered in University/ Private Colleges in the state of Telangana. TS Eamcet is a state level entrance test for admissions into the first year Engineering, Technology, Agriculture and Medical-Allied courses for the academic year 2019-2020. Like Every year, Jawaharlal Nehru Technological University, Hyderabad on behalf of Telangana State Council of Higher Education (TSCHE) is conducting this exam across the state. A huge number of Students who are seeking entry into professional courses have submitted the online applications from March ... to April .. at the official website, eamcet.tsche.ac.in. Jawaharlal Nehru Technological University Hyderabad to be released the Hall tickets for Telangana State Engineering, Agriculture and Medical Common Entrance Test (TS EAMCET 2019) on its official website. The examination will be held form May 03, 2019. Candidates can download their admit cards from here. Enter your registration number, qualifying exam hall ticket number, date of birth and click on submit. The admit card will be displayed on the screen. Save it on your computer and take a printout. Candidates must carry the admit card to the examination centre. 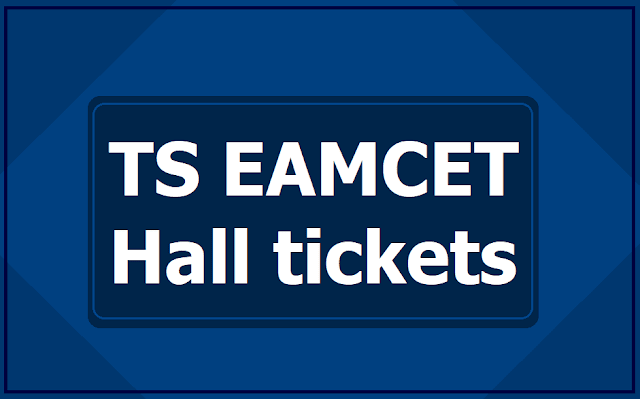 Steps to Download TSEAMCET Hall Tickets 2019: Candidates should visit the official website of TS EAMCET i.e., emacet.tsche.ac.in. ; Click on the link saying TS EAMCET 2019 Hall tickets; The link will navigate you to a new page where you need to input the details like; registration number and date of birth and then submit it. ; On submission, your admit card will appear on the screen. ; Check the details and download the admit card. ; Take a printout of it and keep it safe for future use. 9) Pharm-D (Bi.P.C.) - Doctor of Pharmacy (Bi.P.C.). Telangana State Engineering, Agriculture & Medical Common Entrance Test, TS EAMCET Hall Tickets are scheduled to release on April 20, 2019. As per the official notification available on eamcet.tsche.ac.in, the admit cards or hall tickets would be made available to students online from April 20, 2019 to May 03, 2019. The examination is scheduled to be conducted from May 03. Students who have applied can check the official website on April 20 to download the admit card. Important dates regarding the examination and instructions are also provided below. Kindly note that the admit card or hall ticket would have important information regarding the examination date, center and slot allotted to the student. Admission to the examination hall would be strictly on the basis of the admit card. Students are also advised to carefully go through the instructions on the TS EAMCET Hall Tickets 2019 as and when it is released. Important dates and instructions related to the admit card is provided below. 1. TS EAMCET Hall Tickets would have the information regarding the examination centre and time slot for the examination. Candidates would not be allowed to change the time or centre allotted to them. 2. Candidates are instructed not to sign in the space provided on the admit card. The candidates are required to sign the admit card or hall tickets only in the presence of the invigilator at the examination hall. 3. The TS EAMCET 2019 admit card or the hall ticket would have to be downloaded from the website and would not be sent out to the students. 4. Official notification confirms that the admit card would be available for download from April 20, 2019 on eamcet.tsche.ac.in. The facility to download the admit card would only be available on the official website from April 20, 2019 to May 03, 2019. 5. Candidates are also required to carry a printout of the online application form which was submitted along with the TS EAMCET Hall Ticket to the examination hall. In case candidates have not taken a printout yet, they can do so from the official website eamcet.ts.ac.in. Students to please note that the online application process with late fee is still open. Candidates who have not filled the form for TS EAMCET 2019 still can do so by logging on to the official website. The hall tickets, however, would be released only from April 20, 2019 onwards. Step 6: Remember to carry it in the exam hall. Note: Visit the official website of TS EAMCET 2019 for details and latest update.